Here is the continuation to “Anarchy explained to children” I, a 1931 brochure by José Antonio Emmanuel, a Spanish teacher and anarchist. Emmanuel was responsible for establishing the International Anarchist Library in Barcelona in the thirties of the 20th century. 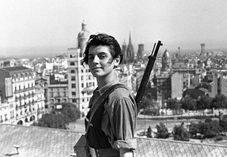 The featured image indicating this post is a photo of Marina Ginestà, aged 17, overlooking Barcelona. It is not immediately connected to “Anarchy explained to children” but illustrates the atmosphere this text emerged before and within. You can learn more about the photo here. This publication has become known to Flockzine via radical leftist blog from Spain Loquesomos. You can find the Spanish original here. Anarchy, dear children, is achieved via the path which leads to it. You should rely on the School, on the Syndicate, and on the Cultural Centre. We are going to explain to you here these three mighty forces which you always need to turn up to. You should understand, easily, that we could not be referring to the bourgeois and reactionist school which you have been made to attend till now. Our school, the school we are offering to you, is not cemented on the basis of silly and foolish teachings, but is a rationalist school. It is crucial that you know that our school has its foundations upon science and this is what will give direction to you in life. Your tutor, the only one, for now, whose efforts you need to acknowledge, defines this school via the aim for a spontaneous development of your abilities, towards the free fulfilment of your physical, intellectual and moral necessities. I have selected Ferrer (referring to Catalan anarchist and educator Francesc Ferrer i Guardia, note by translator). Study his life, follow his work, make him your apostle and guide. The rationalist school we have now is possible due to him, he created it in honour to humanity and did it in the Spain we live in. He took out of the school the three farces I talked to you about earlier: militarism, clericalism and capitalism. He made that science penetrates the brains of the children he educated and he put reason into their hearts. He made your right to education outside the old schools and the shrivelled tutors sacred. He took out of your minds the idea of divinity and replaced it with the cult of justice and goodness. He opened the prison for ideas and converted it into a pleasant and enjoyable place. He saw in you what all people need to see in you: the seeds of a new humanity. Honour Ferrer following his doctrines of redemption. Ferrer was an anarchist; this means he fought against the potent clerical, military and capitalist forces which turn society into a chaos equalling disgrace. You need to learn to fight like this. Initiate yourselves into this doctrine of salvation. Then this new world we are constructing will emerge from yourselves. It is time that you know that if you do not redeem yourselves, if you do not liberate yourselves while still at school, it will be difficult to redeem and liberate once grown up. Redemption must begin within you. This is why Anarchy gives you the School. Let your teachers also understand this highest of truths. If not so, you will be abandoned to your own little forces and you will fall into the arms of the enslavers. The school needs to teach you to be rebels, rebels in this society which is corrupt and disgraceful. The enemies of your parents, of your siblings are and will be your enemies. The causes of your discomfort and your bitterness weigh upon the ones who gave you life and live with you as well. You need to unite them in this sacred fight. The fight which the absolute cease of our pain and unhappiness depends upon. We do not want you in resignation, let resignation be reserved for the bourgeoisie teachers and the scholastic prisons they reign over. The school which Anarchy gives you is the school of freedom. There are three books which will help you get to it. Three books which have educated three generations. Three books which you need to put in your school as guides and drivers in your lives: The Universal Pain, The Conquest of Bread, and The Mountain. Their authors are these three lights still illuminating: Sebastian Faure, Pedro Kropotkine y Eliseo Reclus. Do not forget these three names. Upon reaching the age of twelve, these can not be left amiss in the library which you are building. These will explain to you the reasons for your sufferings, the origin of your enslavery at work, the germs of life and existence, the history of the land. With these you will learn to overcome the difficulties which you meet in your fight, with these you will gather the strength to resist and acquire the hope for what is to come. Let these be your first steps in life: precious staff in your progress. Anarchy, once you leave school, can not abandon you. The more you grow, the more you progress. It makes you continue the fight and strengthens you as rebels. It gave you a school so that you know the world in which you opened your eyes, it made you see inequality, it showed you the roots of egoism, showed you where evil resides, where our eternal enemy is hiding. It showed these to you, made you see them so that you can prepare to fight them and defeat them. Once this is achieved, the doors for another organisation are being opened: the Syndicate. If as children you had one school then as youths you have another: the school of the proletariat. The same enemies that surrounded you as children, the same enemies surround you now. Find an organisation for the fight, a place where you will seek refuge to recuperate your belief, to straighten your ideals and multiply the forces which you need to accumulate for the final and decisive battle. The same anxieties, the same bitterness that is besieging you as children, will besiege you as grown ups. Enter the Syndicate, position yourself in it. All united, all identified, we will resist better. Be faithful and in solidarity with you mates, your brothers in the struggle and the rebellion. This new school – the school of life – do not abandon it. Together with your parents, continue to fight for a better world. So that in this titanic fight you do not loose neither faith, nor enthusiasm. Anarchy provides a third school where the struggle for culture is practiced. These are the Cultural Clubs, in addition to the Trade Unions. It is not only fight for material improvement that needs to unite us. It is the fight for culture that needs to bring us together. The same cravings which you had at school for gathering knowledge, here you need to continue them, widening them, increasing them, intensifying them. You already see, dearest children, how Anarchy is illuminating the path for you. HOW TO MAKE OURSELVES WORTHY OF ANARCHY? Never stop listening to the ones who are fighting like you, the ones who suffer like you. They are your brothers. You had them next to you at school. Now you have them in the workshop, in the factory, in the mines, still thirsty for justice. Wherever you see a brother of yours, help them. Across the borders raised by privileges, your hand should tend to anyone who is a victim of the current bourgeois society. To the ones hesitating, give breath, to the ones who despair and see the triumph far away, give encouragement. Mutual support is a universal duty. Do not imitate the transient, the ephemeral. All evils, push them away from you: they are the legacy of human imperfection which we are chained to. Despite of the chaos of ignominy, raise your eyes to the beauty of Life. All in nature is work, and your mission is to contribute, according to you strengths, to the perfection of this work. Do not resign to being a servant to the machine, nor a slave to the muscle. Dignify work, make it beautiful and pure. Let the book be your best friend, your counsellor, your guide. We will never know enough. The one who accumulates science, accumulates anarchy. Investigate by yourself, clarify the mysteries which surround you. Instruct yourself, educate yourself. This is the only legacy which you leave in Life. Science does not turn the heart to stone. A pure and humane love penetrates our hearts. No matter how far, no matter how distant, every human being is loved by us. The one who loves a lot, protects a lot. If they are weak, protect them. The old, the disabled, the ill – there is much more love which ties us to them because they are weak. The poor elderly person you see, they were once strong like you, valiant like you; the disabled person was once like you as well. Think that you could become like them; think that the bourgeois toil will make you old and ill. Protect them! The land is your mother; the field is your livelihood. If we cultivate, we will collect ripe fruit and best crops. Do not leave land sterile. Give land the care it needs so that it feeds you and gives you life. In the ideal world, sow ideas, spread thoughts, write and do. In the real world, let the seeds fall in all the land that, well looked after and prepared, will fertilize the seeds and turn them into flowers and fruits. Aspire to be free and let the desire for freedom embraces all. Do not enslave anybody. Neither birds, nor any living being can you lock with impunity. Open the doors of all cages, cut the bars of all prisons, where – like the caged bird – human beings suffer and endure. Be free and make free, yourself and the others. Open the doors to your heart, so that all vice goes away, all the defects which have managed to leak in. Be free and be pure: neither have slaves, nor do become a slave. “Toil and fight”, Anarchy tells you. Before you were told: Toil and pray. Leave the prayers, leave the orations. There is only one pray you should never forget: the one of work. Work for the good of Humanity, so that the pains cease, so that the sufferings end, so that the bitterness goes away forever. Be happy in a happy society. Be free in a free society. This is Anarchy, dear children. Blessed you are if you understand it and practise it! Begin, then, for yourselves, a vision of a new life of purity and goodness.